When are the times of worship? At 10.30am each Wednesday and Sunday morning. Please see our page on how to get to the church. As a “Green Church” we encourage car-sharing where possible. What happens at the Parish Eucharist on Sundays? You will first be welcomed by people of St Alban´s, given a hymn book, a news-sheet and a service booklet and invited to sit anywhere in the main part of the church. At 10.30 the choir and clergy enter as everyone stands to sing a hymn (a song of praise to God). The service is a called a “Eucharist”. This comes from a Greek word meaning “thanksgiving”. At the heart of our worship is our giving thanks to God but we also acknowledge our own fraility and fragility, our need of God and each other. The service is in three parts. First, we gather and ask that God will open our hearts and allow us to see something of his beauty and freshness, to see who we really are too, to acknowledge where we have gone wrong and to be forgiven and strengthened for the future. Secondly, we listen to three readings from the Bible: from the Old Testament (the Jewish scriptures), the New Testament (early Christian letters and texts) and from the Gospels (the early accounts of the life and teachings of Jesus). Because the Gospel is the heartbeat of our community, it is read from the middle of the congregation, surrounded by us all. It is the pulse that gives the body of the Church its life. After the Gospel has been read, a talk (sermon) is given that explores what we have heard and tries to enrich our reflection. Sermons are important at St Alban´s. We believe God gave us brains and so we must think, ask questions and not be afraid of exploration. We also believe that God gave us hearts and that we need “de-frosting” in order that our lives and love may be enlarged for the sake of the world and people God loves. You can listen to some recent sermons here. Lastly, after giving voice to our faith, praying for those in need and sharing peace with each other (turning to our neighbour and saying “Peace be with you”), we remember the night in which Jesus gathered with his friends, gave them bread and wine and asked them to remember him in this way. Because Jesus Christ is for us the window onto the nature and reality of God, our remembrance is more than just nostalgia; it literally re-members us together as a Christian family, recalls us to the heart of reality. We believe that Christ is present in the bread and wine (we don´t fully understand how) and that our communion with him leads us into deeper communion with one another. For this reason, we are quickly sent into the world after receiving the bread and wine, so that we might bring Christ´s priorities and peace to our own networks and communities. The last words we hear are “go in peace to love and serve the Lord”. Whatever you are comfortable in! There are no rules or regulations and a typical congregation will include all age groups. Of course. Please contact our chaplain (see above) with your request. We bring all these requests before God at the main Sunday service. In church there is also a candle stand where people often say a prayer as they light a candle of hope. Christian life is lived in relationship with God through Jesus Christ, and in common with other Christians in the church seeking to deepen that relationship and to follow the way that Jesus taught. For Christians God is understood and known as Father, Son and Holy Spirit: Father – God is love, caring for creation and for every human being as God’s beloved child. Son -God is as he has revealed himself to be in the historical person of Jesus Christ. Jesus’ life, death and resurrection hold the key to knowing and loving God, and to making sense of life, before and after death. Holy Spirit – God is alive, loving and active, comforting and challenging and inspiring faith, justice and truth. God sustains the life of the world, giving spiritual gifts to the church and bearing his spiritual fruit in the world – changed lives and a transformed society. 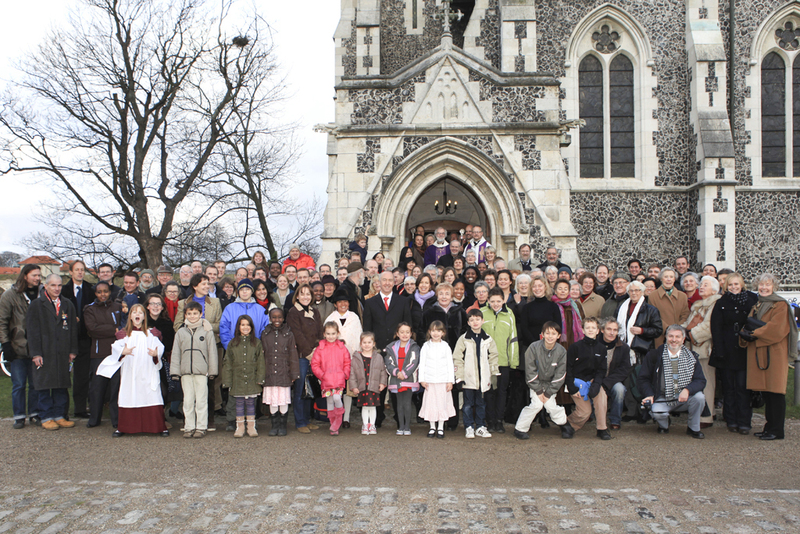 How do I join St Alban´s Church? Just by coming on Sundays. Please fill out the "Welcome Card", so that our chaplain can arrange to meet with you as soon as possible. After six months you can apply to join the Electoral Roll of the church. That gives you the opportunity to vote at our Annual Church Meeting. What groups can I join at St Alban´s? Please see our Groups and Activities page. What´s the history of St Alban´s? Please see our About the Church page for a full history.